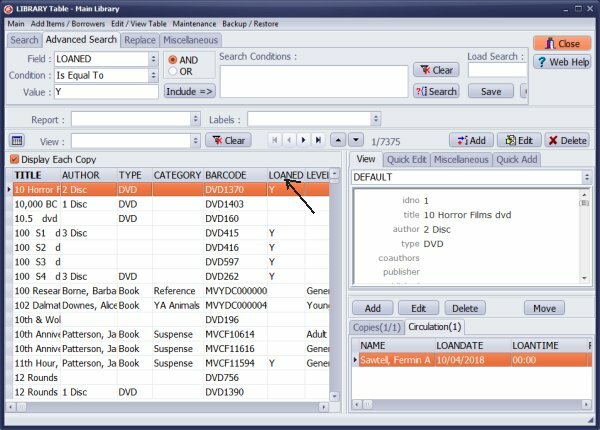 ﻿ Handy Library Manager: how to display checked out items in the library main catalog. 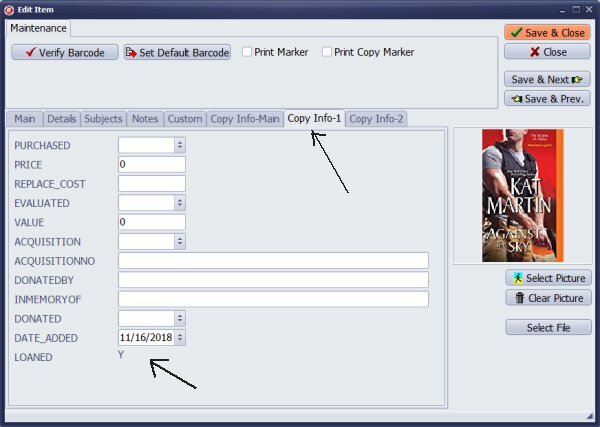 Help, how to topics > Tracking circulation transactions > How to display loaned out items in the library main catalog window? 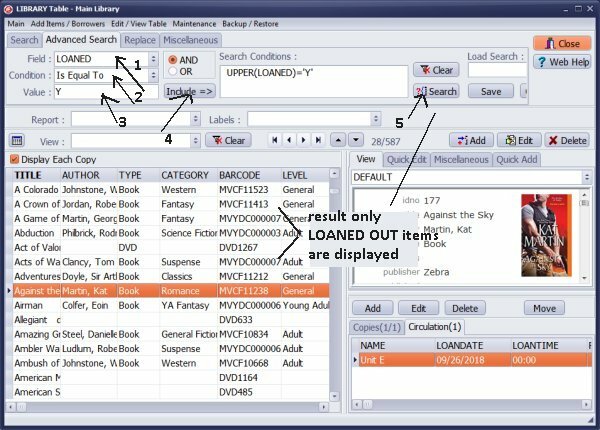 How to display loaned out items in the library main catalog window? To view all loans, outstanding items, or overdue items use the Manage Loans window. Sometimes you would like to check the LOANED status in the Libary table. You can do that. Each item has the predefined LOANED data field. The value of this field is Y when item is checked out. Search the library catalogue for items that are checked out. Define the following search LOANED is equal to Y, (1-5). Execute the search. Only checked out items are listed. To find LOANED data field, in the library main catalog click Edit. In the Edit window click Copy Information. You can include the LOANED data field on the grid. Review help topic how to define displayed columns on the grid. Question: Can I print a list of the books that are loaned out? Is it possible to print a list of the books we have loaned out? Not single sheets but a total list? To print list of books that are loaned out: define search LOANED=Y, define report, print report. Question: Where can we find a certain material is checked out? When we look for a book with title or author, we find at main library database. It does not show whether that item is checked out or not. The LOANED = Y indicates if the item is checked out or is not checked out.